Waste diversion, the process of properly channeling disposables away from landfills (to recycling, composting centers, renewable energy facilities), is a too-quiet cornerstone in the fight against inefficient energy use, and its corresponding GHG emissions. To put this concept of waste diversion in more tangible terms, the United States generates about 230 million tons of trash per year; each person "dumps" about 4.6 lbs of trash per day. Out of your 4.6 lbs, only about a quarter of it on average is diverted. San Francisco, on the other hand diverts approximately 72% of its waste; each person ends up only sending about 1.3 lbs to the landfill, whereas the rest is either recycled or reused. The raw materials from bottles and cans are refashioned, and your organic waste can end up as compost or even as sustainable fuel for waste to energy facilities. 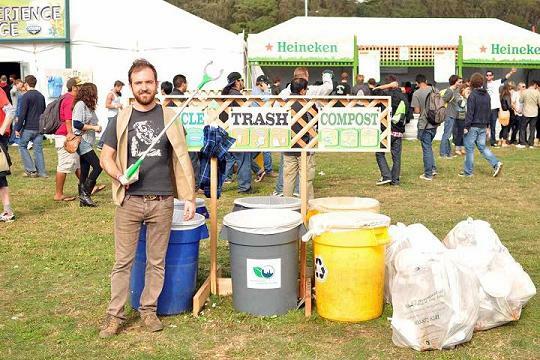 Thus when I ventured to the third annual Outside Lands Festival this past Saturday and Sunday in Golden Gate Park, I was eager to test the festival's ability to properly minimize, sort, and divert waste. My test was a simple one: My aim was to stimulate concert-goers who were clueless on how to dispose of any of their waste and see if the staff at the waste stations would right my wrong. In short, I purposely put biodegradable cups in the trash, plastic bottles in the compostable bin, and leftover food in the trash (and multiple different combinations of clueless waste disposal). I experimented at 10 waste stations, all of which were stationed with three different bins (waste, recycle, and compost) and a festival representative, some armed with litter-picker-upper tools, but all armed with the knowledge of proper waste disposal. At nine of the 10 stations I tested, my erroneous waste disposal was corrected completely by the waste representatives (consisting of paid and volunteer members of San Francisco's Department of the Environment, Clean Vibes, and Another Planet Entertainment). I was either stopped prior to an improper disposal (this happened at four stations) or I saw my mistaken dumping being corrected from afar. In an environment in which knowledgeable staff can assist and, more importantly, help teach us novice dumpers how to properly dispose of waste, waste diversion rates will rise. However, if we concertgoers, and the population in general fail to heed the simple lessons of dumping, our landfills will grow, methane emissions will increase, and our ability to live sustainably in our surroundings will become ever so difficult. Just because we don't have federal climate legislation doesn't mean we the people can't be proactive; even the smallest gesture can make a difference.